When it came in September 1975, Papua New Guinea’s independence was marked by both anxiety and elation. In the euphoric aftermath, decolonisation was declared a triumph and immediate events seemed to justify that confidence. By the 1990s, however, events had taken a turn for the worse and there were doubts about the capacity of the State to function. Before independence, Papua New Guinea was an Australian Territory. Responsibility lay with a minister in Canberra and services were provided by Commonwealth agencies. In 1973, Prime Minister Gough Whitlam declared that independence should be achieved within two years. While Australians were united in their desire to decolonise, many Papua New Guineans were nervous of independence. 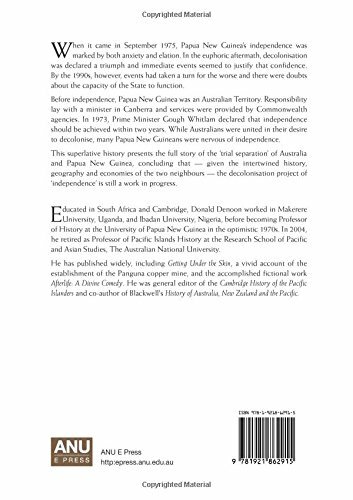 This superlative history presents the full story of the ‘trial separation’ of Australia and Papua New Guinea, concluding that — given the intertwined history, geography and economies of the two neighbours — the decolonisation project of ‘independence’ is still a work in progress.